From the moment we laid eyes on this FJ43, we knew it would be an exciting project. 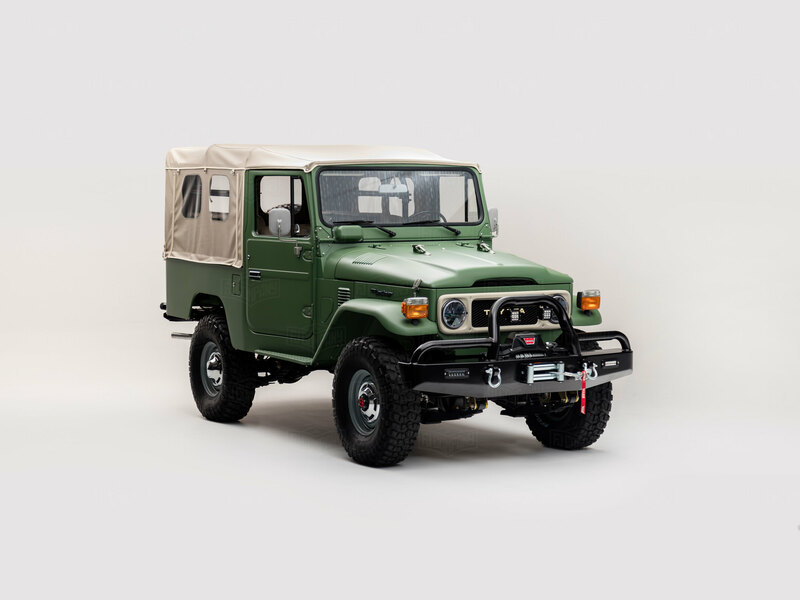 It's one of the last of its kind — a final-model-year FJ43. Ever since it rolled off the line in 1984, this Land Cruiser has had three owners — the last one was a Toyota technician, who kept it in impeccable shape. The new owner is a seasoned car collector in Steamboat Springs, Colorado, who wanted a daily driver for his farm — with a bit of attitude. So we began a full frame-off restoration of the model, adding some premium touches. This FJ43 now rides Rocky Mountain high — on BF Goodrich Mud-Terrain tires and an Old Man Emu suspension with a two-inch lift. We did a custom front bumper with inset LED fog lights, Warn Zeon winch, double battery, and our marine-grade premium sound system. Safety is enhanced with a custom-built factory-style roll bar and front disc brakes. The reupholstered beige vinyl interior matches the custom soft top and creates a striking contrast with the black floor mats and matte green exterior — making this one of the best-looking FJ43s we’ve ever made.